Cone shells are fairly small shells that are shaped like – can you imagine? – a cone. Think of a pointed ice cream cone – a sugar cone – without an opening for the ice cream. Instead you will see a tight, fairly flattened spiral. They can be found all along the coast of Florida and over to Mexico. 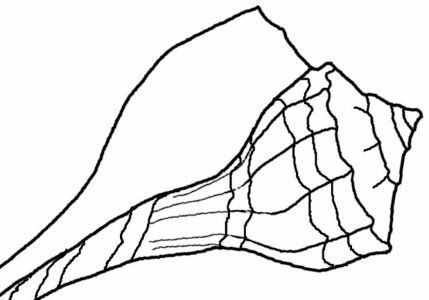 Other types of cone shells can be found in tropical waters from the Carolinas to the Indian and western Pacific oceans. The mollusk uses poison to kill it’s prey and in the larger species it can be fatal. Always be careful when handling live cones, although here in the US we don’t have the large ones. 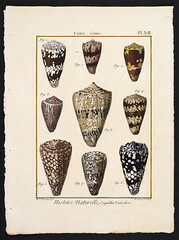 The outside of the Alphabet cone (Conus spurius atlanticus)- scroll down the page at FloridaSheller.com to see his collection – is smooth with reddish brown or orange to yellow spots in irregular shapes. These shells are not exceptionally large and only grow to about 3 inches (7.6 cm) long, but they have the most interesting patterns on the outside of the shell. In fact there is a man who has collected the “alphabet” in cones – read about him here. Next Post How Is A Seashell Made? i understand but is there a chance if u can tell me how they were made/ created? please? I wrote this page about how shells are made. Hope it helps.